New, bigger&better scans of the same comic uploaded 5½ years ago. Synopsis: Treasure hunters want to know the location of the plane wreck that brought Ann to Kaänga's jungle, believing that it contains valuable jewels. Kaänga helps raise the wreck and then insures that the treasure hunters are eaten by crocodiles. Ann declines to look at the planes passenger manifest and burns it. Credits: Script: ? [as Frank Riddell] | Pencils: John Celardo (signed) | Inks: John Celardo; Myron Strauss ? ; Maurice Whitman ? Synopsis: Hunters are trapping elephant calves in Simba's jungle. Simba and the elephant herd put them to flight. Synopsis: Thief Slade Carter is stealing gold from Joan's father's mine. 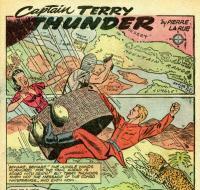 His much abused pet cheetah turns on him, killing him, and foiling his escape with the gold. Synopsis: A brief description of some of the weapons used by native peoples. Synopsis: An ape believed to be Ogg murders many villagers. 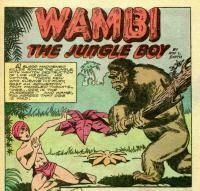 The real Ogg arrives in time to save Wambi and Tawn from the killer ape. Synopsis: After a landslide, a tribe descended from ancient Egyptians emerge from a long-sealed cave and proceed to make slaves of the N'goris. Tabu and N'mino go to their rescue and after freeing the slaves, Tabu reseals the cave. Credits: Script: ? [as Mack] | Pencils: Howard Larsen (signed) | Inks: Maurice Whitman ? Synopsis: Brief natural histories of the honey guide, the ostrich, the secretary bird, the flamingo, and the vulture. Synopsis: A woman disguised as Camilla assists slavers in taking villagers. 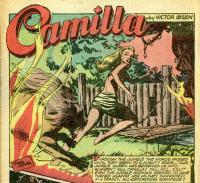 Camilla exposes the fraud and frees the slaves and traps the slavers with fire-maddened animals.